KMS Plastic 4 Bolt Flange Blocks are made from engineering grade glass filled PBT polyester and are completely interchangeable with conventional cast iron blocks. These maintenance-free blocks have excellent mechanical strength, stiffness, and dimensional stability, and never rust or corrode. 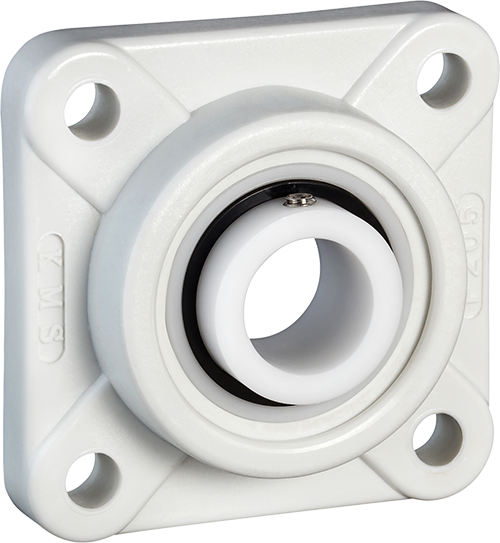 KMS 4 bolt flanged housings are used when the bearing mounting surface is perpendicular to a shaft axis. 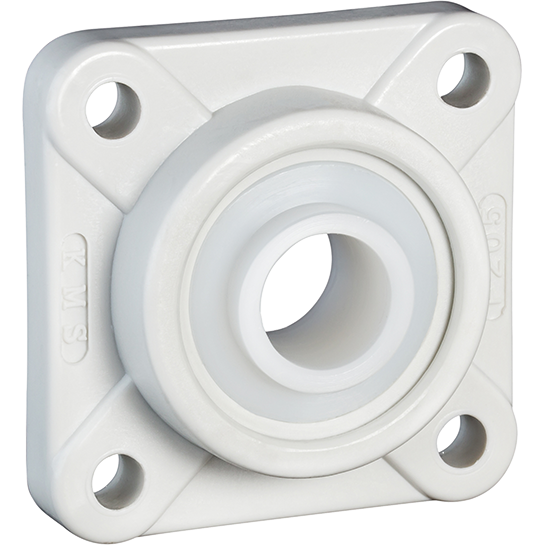 Four (4) bolt flanged ball bearing units have a square shape with 4 holes for increased mounting support. KMS plastic 4 Bolt flange blocks are dimensionally interchangeable with conventional cast iron blocks. Polymer flange blocks are currently being used in many industries including food processing, bottling and packaging machines, chemical processing, and pool and marine applications. KMS flange blocks can be purchased with a variety of KMS insert bearings to best suit your specific application. Coated or plated cast iron housings can scratch, chip and peel. In fact, the very act of installing them causes the finish to be removed around the edges of the bolt holes beginning the process of corrosion. KMS housings are a solid base glass-filled PBT polymer which requires no coatings for corrosion protection. The KMS polymer surface is much more hygienic than cast iron. The rough surface of cast iron can harbor objectional dirt, mold, and bacteria. Additionally, the mounting surface, or the bottom of the block, is machined for flatness so that dirt and water do not lead to the formation of mold or bacteria. 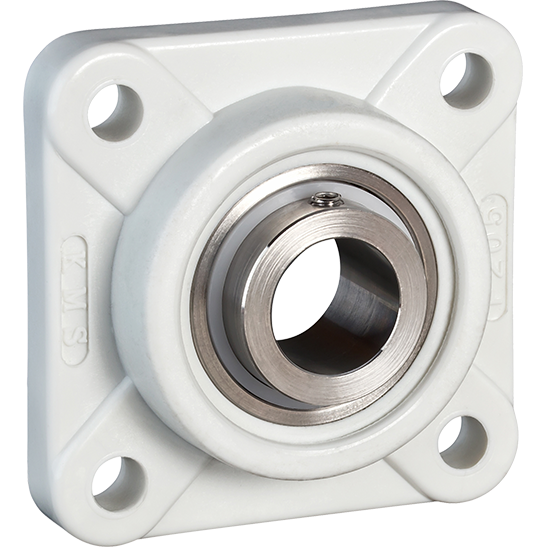 The KMS block and bearing units are unique in that they can run fully submerged without lubrication. They can handle up to 120°f when submerged in liquids and even higher temperatures when they run dry. For alternative solutions for a higher temperature capability please contact KMS Bearings, Inc.
(SSIB) 316 Stainless insert ball bearing, 316 Stainless races and balls. These maintenance-free blocks have excellent mechanical strength, stiffness, and dimensional stability, and never rust or corrode.